Pixar's Cars Mural for "Baby Spice"
This fun mural was painted by hand, directly on to all the walls in this 5m x 5m boy's bedroom, including over a fitted wardrobe. The work took 25 days. Any quote for similar work would be based upon a similar timeframe, depending on the size etc. Painted in the bedroom of Emma Bunton (Spice Girls) and Jade Jones' (Damage) eldest son around the whole bedroom. The mural design features many of the film's great characters like Lightning McQueen and Mater also Sally, Doc Hudson, Luigi, Guido, Sheriff, Chick Hicks and many more, plus cameos from Buzz Lightyear and Spiderman. 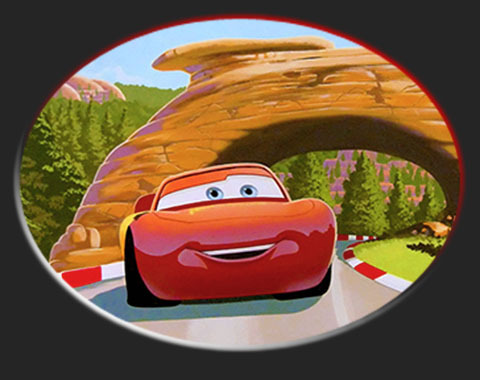 The landscape was designed to look like a cross between the mountains in the Cars movie, and a European race circuit, to bring more green colours into the room. I felt quite honoured to be asked to paint these celebrities' boy's room. This Pixar's Cars mural goes around the whole room, about 5m x 5m. Doc is all fired up flying over the hill, Dinoco's biggest fan RV sups on some coolant, and at the racetrack the Sheriff can't book anyone for speeding here! Last corner of the Cars mural, with airship, Dinoco helicopter, and shows the plastic protection used while working. Race track grandstand with Cars crowd, pit lane and Radiator Springs Hills behind, from Pixars Cars. Kids mural with cameo from Spiderman. Luigi and Guido, next time I'm doing Guido in that rainbow wig! The RV fan base watching The King - and a cameo this time from my VWLT35! I hope you have enjoyed looking at these new photos of this mural, and please get in touch if you would like something similar.